The polo shirt, once at the domain of polo-playing gentry, has now become a fashion staple for every man’s capsule wardrobe. The polo shirt is most versatile and superior to any other garment because you can wear it with practically anything. Layer it up with a jumper and pop a bit of collar in the autumn and winter months, team it with shorts in summer or chinos for the evenings, whatever you decide, the polo will help ace that smart casual look. Taking a look at the smarter side of short-sleeved attire, we at Apache have hand-picked some of our top polo t shirts in cool shades of blue for summer fashion 2014. First up is this sporty staple by Lyle & Scott. The Micro Argyle Printed Polo Shirt by Lyle and Scott displays a touch of premium with the all over Micro Argyle print in Petrol blue. The printed design subtly references the brand’s Scottish roots and leaves you with ultimate vintage style. The slim fit Lyle Scott polo also includes a ribbed collar, cuff detailing, button placket detail, and of course, the iconic Golden Eagle logo embroidered to the chest. Be sure to check out this bold print in New Navy. 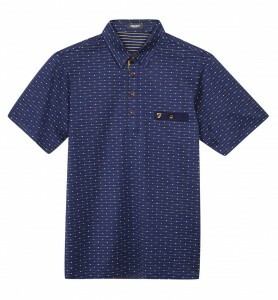 Next donning the smart/casual look is this Rafi Dobby Polo Shirt by Farah Vintage Clothing. 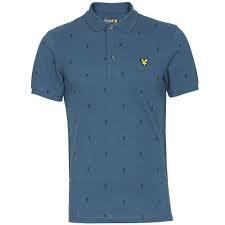 The Farah Vintage polo comes with a repeat dotted pattern to create a balanced mix of classic and contemporary style. It features an extended 4 button placket and a single button chest pocket with a delicately embroidered F Farah Vintage logo. Perfect for everyday smart wear. New for summer 2014 is the Jet Pocket Penny Collar Polo Shirt by Fred Perry. 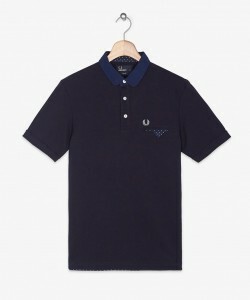 This 60’s inspired polo top takes a nod to the mods when the Fred Perry brand was rising to prominence, and when the polo shirt became a must-own for all members of the mod movement. Take on that smooth and sophisticate look with its small penny collar and dapper polka dot trim on the jet chest pocket. Shop the full range of polos for men at Apache Online, UK.